Summary: Electrical Circuit Question: We have a new shed and would like to install an electrical circuit to it. I have added internal wiring for lights and small power tools, but the circuit breaker box I have installed in the shed is pretty jury rigged with an extension cord that makes it all pretty unsafe. We have a new shed and would like to install an electrical circuit to it. I have added internal wiring for lights and small power tools, but the circuit breaker box I have installed in the shed is pretty jury rigged with an extension cord that makes it all pretty unsafe (forget about meeting code). What I would like to do is run a line from the house to the shed in a way that is safe and hopefully meets code as well. My power panel is in the basement on the other side of the house so I am guessing that it will be about 75 foot from the house breaker panel to the new panel in the shed. The shed currently is wired with three 20 amp breakers and all wiring is 12/2 ROMEX that I installed myself. The breaker box is a 100amp home line by SquareD. I plan to run a few different power tools and a shop vac, and the rest of my power requirements are for florescent lighting and recharging batteries for my power tools. Does 6 AWG sound sufficient for the usage I am proposing based on the distance. If I do have to bury the cable between the shed and the house, can I do that with conduit, or should this be some kind of direct bury cable. Do I need something like the air conditioning has on the outside of the house to act as a disconnect? Hi Joseph - Great Electrical Repair Question! I'm very glad to hear that you want to get your shed wired safely. Your information states that you have already installed 12/2 Romex connecting to 20 amp breakers. Based on the known loads, you really don't need a large circuit to feed the Sq D Home line panel. The distance of 75 feet will not require additional calculations for voltage drop. The following is based on the 40 Amp 240 Volt circuit. What I don't know is how the basement is finished off. Are the walls and ceiling sheet rocked or is it open and accessible? The method used to install the wire through the basement will depend upon accessibility and the ability to protect the cable by stapling it to wood framing. A 8/3 Romex cable with ground (4-wires in all) Romex cable may be installed supporting with approved staples no more than every 4 1/2 feet and with 12 inches of entry to a box. The cable should run in a way so that the cable is not hanging open between wooden supports but secured to wood supports where the cable will be attached to and protected. A conduit will need to be installed through the basement ceiling or around the outside of the home to the outside wall nearest to the shed. 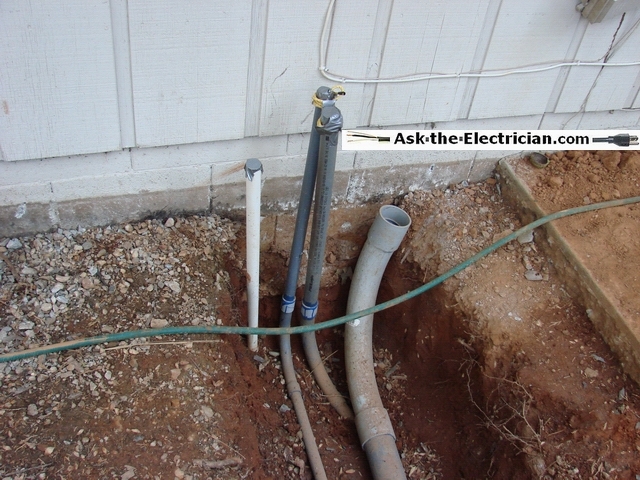 A junction box would need to be installed to junction the wiring coming from the basement panel, and join the wires leading out to the shed. From the outside wall junction box I would recommend installing a 1 inch PVC conduit in a trench to the required depth of 18 inches which would end at the shed and up to the shed panel location. The larger size is not that much more expensive and will allow you to pull the wire through much more easily. (Direct burial Type UF Cable may be installed at a depth of 24 inches, but I do not recommend it due to higher cost) Measure the distance from the outside wall junction box to the shed panel and add extra length to allow for making up the wires. Purchase the same size and type of wire. Please note that all wire installed inside a conduit should not be of a Romex type, but single insulated wires such as #8 THHN Stranded Wire. I prefer stranded because it is easier to handle and it pulls through the conduit nicely. At the shed panel the Ground and Neutral wires are separated and not bonded. The Main Panel is the only location where the Ground and Neutral wires are bonded. In some cases it is necessary to install a Ground Buss Terminal Block that can be anchored to pre-drilled holes inside the panel. Any Bonding jumpers from the Neutral Terminal Block to the frame of the panel must be removed. Only the Ground Buss Terminal Block may be Bonded to the frame of the panel enclosure. The incoming 240 Volt lines should be attached to a 2-pole 40 Amp breaker which will serve as your Main Disconnect for this panel and will serve to be conveniently shut off the panel when work is needed to be done at this location. Please keep in mind that a Main Breaker configuration like this is just like a regular circuit breaker where it protects the circuit, except that the incoming wires will be energized at the terminals when this main breaker is shut off even though the panel is off. The flow of electricity works in the opposite direction for this type of configuration. Make up the wiring at the junction box location on the outside wall using approved wire connectors for the size of the wire installed. If the junction box is metallic then the box must be bonded to the ground wires using terminal lug or using the provided attachment found inside the box in most cases. Making up the wiring at the basement panel is done last once the shed panel wiring is installed and closed up. As mentioned above, if the basement panel is the Main Panel then the Neutral and Ground wires may be attached to the same buss in the basement panel, and this will be evident that the rest of the circuits follow this method as well. If the basement panel is not the main panel then you will notice the ground and neutral wires separated and this should be followed as well. As for the shed circuits, the outlet circuits should be protected by GFCI either from a GFCI Circuit Breaker or by installing a GFCI Outlet in the first position of the circuit where the Line is from the panel and the Load is the wiring traveling through to the other devices. GFCI protection is not needed for dedicated lighting circuits. Romex wiring which is installed in the shed should be covered with sheet rock or other wall covering as to provide protection for the wiring, otherwise the wiring should be installed using conduit or approved flexible conduit and these conduits being attached to boxes approved for conduit attachments. Junction boxes and device boxes must be bonded to the ground wires where there is a ground terminal method provided, or by using an approved Green Ground Screw as commonly used for metal junction boxes. Please note that any project like this should be permitted through your local building department and inspected. Additional local codes and regulations may apply. As always - hiring a licensed electrician will insure that the project is installed safely and according to your local and national codes.